We live in a world where all too many people purposefully contribute to the harm of other human beings either by action or inaction. Most violence emerges with some kind of rationale to legitimize its use. Based on his work with extremely violent offenders, the psychiatrist James Gilligan argues that even the most seemingly pointless acts of violence still have some justification in the perpetrator’s mind. Supposedly rational uses of violence like warfare and capital punishment follow their own self-conscious logic. At the core of this logic rests a commitment to the necessity of retribution. When the moral order is violated by wrongdoing, ‘justice’ requires revenge. Throughout the world, religiously-based violence draws heavily on the logic of retribution—think of the struggles in Northern Ireland, the Israel/Palestine conflict, and the Sri Lankan civil war. The legitimacy of retribution is also a common cultural reference point in the United States, but where does it come from? In the U.S., it links directly to a particular brand of Christian theology. Deeply ingrained in the religious consciousness of the United States is the belief that retribution is God’s will. According to the logic of retribution, holiness governs God’s behavior. As a holy God, God cannot stand to be in the presence of impurity—of human sin. Human beings invariably violate that holiness because all of us are sinners. God is bound to respond to sin with punishment, because to forgive would violate God’s holiness. Compassion without satisfaction is not possible for God in this tradition. God takes human sin with the utmost seriousness. Our sins are profound. Due to the extremity of these offenses, God can only relate to human beings if there is death of extraordinary profundity on the human side to restore the balance. This happens through the enormity of the death of God’s own son, Jesus Christ, whose own powerful holiness may balance out the un-holiness of humanity. Hence, salvation is achieved as the result of violence. Only the ultimate act of violence—the sacrificial death of Jesus Christ—satisfies God’s holiness. In the light of this understanding, the logic of retribution justifies the human use of violence. The criminal justice tradition of the Western world reflects this philosophy—that sin or crime requires punishment in order to restore the moral balance. Hence, the overriding justification for harsh punishment, even to the point of death, is that retributive justice is required whenever ‘natural’ or ‘divine’ laws are violated. Such retributive justice is seen to restore the moral equilibrium in society. In some respects, criminal justice in the U.S. evolved away from strict adherence to retributive justice between the mid-1800s and the 1970s, to embrace a model of “penal-welfare”—with more concern for the rehabilitation of offenders and less of a focus on punishment. However, with a significant increase in the crime rate in the United States in the years that followed World War II, politicians came to discover that the rhetoric of ‘law and order’ gained them popularity and votes. The legal historian David Garland traces the extraordinary transformation of the U.S. criminal justice system as a result of the re-emergence of retribution as its guiding philosophy. One indication has been the increase in the incarceration rate from about 100 prisoners per 100,000 of the population in 1970, to more than seven times that level in 2013—even in the face of little evidence that such an increase has enhanced public safety. The paradigm of retributive justice may be characterized like this: crime is a violation of the unchanging, impersonal law, and the state is the victim. Offenders must get what they deserve. Justice aims to establish blame and administer pain to satisfy the demands of the moral balance, so violations must be countered by punishment. The process of justice finds expression in a conflict between adversaries in which the offender is pitted against the state. One side wins and the other side loses. This dynamic echoes the retributive theology of much U.S Christianity, in which the violation of God’s holiness requires punishment in order to balance the moral scales of the universe. This paradigm is a recipe for alienation, as is readily apparent in the United States. By making the satisfaction of impersonal justice the focus of the response to criminal activity, the human beings involved—whether victims, offenders, or members of the community—rarely find a sense of wholeness or restoration, whereby the damage caused by crime can be healed. We can learn a great deal about society by looking at its prisons. When I look through the magnifying glass of the U.S. prison system, I see a society that’s focused on trying to control violence through violence, willingly inflicting incredible suffering on an ever-increasing number of desperate people. This creates an intensifying spiral of violence. People hurt others, and then the state steps in and hurts the violator. Part of this state-sanctioned hurting takes the form of placing the violator in a culture of extreme violence—the prison—that further socializes that person to be more violent. Eventually—and often more severely damaged than when entering the prison system—the violator returns to society primed for yet more violent acts. This spiral must be broken. A crucial step in breaking free from these destructive dynamics is to recognize that the beliefs that underlie retributive justice are human beliefs. The spiral of violence is not inevitable; the ideas that underpin the retributive paradigm may be challenged and refuted. Ironically enough, given the roots of this paradigm in Christian theology, a fresh reading of the Bible—free from the filters of the later retributive aspects of Christendom—provides a very different understanding of justice. I and others call this “restorative” rather than retributive justice. Restorative justice offers a different perspective on how societies respond to violence, one that strives for healing among all those involved rather than simply punishing wrongdoers. This other paradigm is also religiously-inspired. For example, take the theme of salvation in the Bible. In the Old Testament, salvation is not presented as being linked with God’s will for violence. Instead, it’s an expression of God’s mercy. Sacrifice and obedience to the law are ways for people to show their commitment to God as a response to God’s saving works. When relationships are violated, God’s intention is to restore them, not to balance the scales of justice through punishment. Jesus’ own teaching agrees with the Old Testament’s understanding of salvation. He never links salvation with the logic of retribution. Instead, the God of Jesus needs no act of violence in order to establish a restored relationship with human beings. Jesus simply forgives sinners and seeks to heal them. The gospels do not present Jesus’ death as a sacrifice that is necessary to satisfy God’s honor, to placate God’s holiness, or to balance the scales of justice. Jesus died because of the combined violence of the social forces he challenged in his life. These included the cultural exclusivity of the Pharisees, the religious institutionalism of the leaders of the Temple, and the political authoritarianism of the occupying Roman hierarchy, especially the governor, Pontius Pilate. Jesus’ death exposes the forces that put him to death and reveals that those forces are rivals to the true God. The crucifixion of Jesus reveals the difference between the reign of God and the rule of these idolatrous powers. The powers use violence to achieve their aims; God’s reign does not. The significance of Jesus’ resurrection may be found in the way in which it vindicates Jesus’ life, reveals the powers as idols, and promises that trust in God’s love is the source of freedom from these idols and the restoration of harmony. The Bible portrays the means of salvation as free from sacred violence. Hence, God never desires violence, an affirmation which removes the ground from underneath the logic of retribution. This realization should lead biblically-oriented people to seek alternatives to all justifications of violence as the appropriate response to wrongdoing. 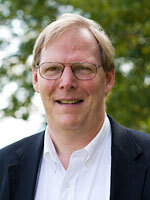 Ted Grimsrud is Professor of Bible and Religion at Eastern Mennonite University. He is the author of numerous books and has often written about restorative justice and Christian theology. Ted’s most recent book is The Good War That Wasn’t–and Why It Matters: World War II’s Moral Legacy. This entry first appeared at OpenDemocracy.net, and is re-posted with permission.